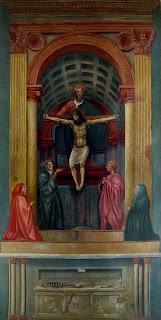 The Holy Trinity by Tommasso Cassai aka Masaccio is the first painting to use linear perspective. This was a system devised by Masaccio to create the illusion of depth in a two dimensional image. This painting has been the subject of much scrutiny by artists and designers alike because it also utilises a system of visual hermetics [apparently]. The notion is that if you look at the painting your eye is deliberately taken on a journey from one 'invisible' point to another. It is a contrived and deliberate tool used to make you see the image in a particular way, the 'hierarchy' of visual information, what is more/less important, is determined by the producer while the viewr passively receives information in a pre-determined way. It is visual communication/dictation/indoctrination. 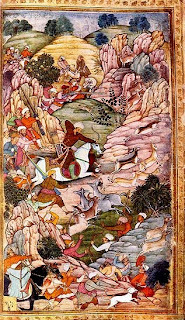 This is an image depicting a scene from the memoirs of Babur, a Prince from Samarkand in the Uzbek province. The image seems free flowing/dynamic/organic and almost baroque. But if you look more closely it is systematic. There is a hierarchy evident in the arrangement of the figurative elements and the characters who appear are generic, stripped of individual personality. They represent something, arguably they are abstracted. This enables the informed viewer to read the image accurately. Again this is systematic, a language, an agreement between producer and viewer.